All right, here we go. 2013 free agents. This year, 85 players (18 domestic, 67 international) qualify for free agency. In practice, only a small minority will file and change teams. I will highlight the interesting ones; here’s the full list in Japanese (Google Translate may work all right for that). Players who have accumulated nine years of service time are eligible to move overseas. This year’s FA class is undoubtedly headed by Hanshin closer Fujikawa, NPB’s most dominant reliever over the last several years. Kyuji has been on the nichibei scene for years; he was actually the first player I profiled way back in 2008 and has since made a perennial habit of asking Hanshin to post him and being turned down. Now as a free agent he’ll finally get his shot. Kyuji isn’t the same guy as he was in 2006, but he still get’s plenty of swinging strikes with the usual vertical movement on his fastball and splitters in the dirt (more data here). His K rate in 2012 was 10.95 per 9, which is great but actually down a bit from his usual 12-14 range. He’ll certainly command an MLB contract, but it seems likely that he’ll begin his MLB career in a middle relief role. If Nakajima’s name sounds familiar, that’s probably because he was posted last offseason, and his negotiating rights were won by the Yankees. 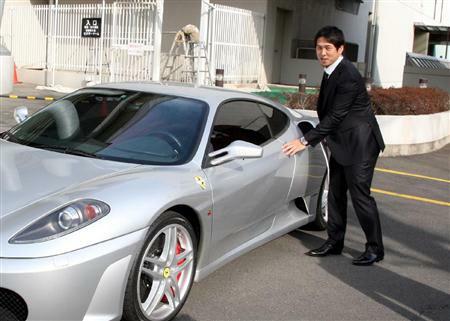 Nakaji and the Bombers failed to agree to a contract, so he hopped in his Ferrari and headed back to the Lions for another year, putting up a healthy .311/.382/.451 slash line. His batting average might have led the Pacific League had Lotte not gutlessly pitched around him on the last day of the season, but instead ended up a single point behind Katsuya Kakunaka. His OBP ranked second in the Pacific League, and his slugging pct was fourth, and well ahead of the next middle infielder. In the field he seems to make the play he gets to, but has lost some range, and the consensus is that he’s probably not a full-time MLB shortstop. Anyway, now Nakajima is back on the market as a free agent. I was a big fan of the idea of Nakaji in New York, acclimatizing himself to MLB while getting 300 or so at-bats spelling Derek Jeter at SS and Alex Rodriguez at 3B, but obviously that didn’t come to fruition. There were other MLB teams interested in Nakajima last time around, so I think there is little doubt he’ll find an MLB deal this year, but it will remain to be seen what kind of role he winds up in. There are a number of things to like about Toritani: he’s played every game since 2005, he led NPB in walks by a wide margin in 2012, defensively he inspires a bit more confidence at shortstop than Nakajima. On the flip side, his power evaporated with the introduction of the new ball in 2011, we have yet to see an NPB shortstop move to MLB and stick, and the most observers seem to agree that he’d be better off remaining in Japan. If his defense and plate discipline hold up, his skill set sounds Oakland A’s-ish, but that’s hardly a given and Hanshin will make a big play to keep him. His best financial offer will certainly come from Japan and I think he’ll probably stay put. Tanaka has been on the free agency market before, but he signed a multi-year contract with Nippon Ham that included an opt-out that allows him to pursue an MLB deal. He is expected to exercise that right. The book on Tanaka is that of a small-ball player: he’s a rangy second baseman who hits for average and draws walks, gets bunts down and steals bases, but offers minimal power. As such, of the infielders listed here he most obviously profiles as a utility guy, though his glove is probably the best of the three. Reporting out of Japan indicates that he seems willing to take a minor league contract, and if that’s the case someone will give him a chance to win a job. Incidentally, he may have kind of a roundabout advantage in that having been a teammate of Yu Darvish for several years, MLB scouts should already be pretty familiar with him. You guys remember Okajima. After the Yankees terminated his contract last year (that’s two nearly-Yankees Jima’s this list), Okie signed with Softbank and had a strong year, not allowing an earned run until August. He’s angling for an MLB return this offseason. There are no significant posting candidates this offseason. Summary: These notes are about a game that took place on Tuesday, June 7. Nippon Ham edged Chunichi 1-0 in a great pitcher’s duel. What a pitching matchup. Yu Darvish was his usual self, striking out 10 with no walks and three hits in another shutout, running his personal scoreless streak to 44 innings. But Wei-Yin Chen managed to keep up with him and pitched a game that would have earned him a “w” under normal circumstances. Darvish did everything well — he kept everything down, or unhittably high in the zone; got ahead of nearly ever batter; got into only two three-ball counts; surrendered virtually zero hard contact. Catcher Keiji Koyama managed two of Chunichi’s three hits, a single off an early-count fastball, and another off a slider that got a little too much of the plate. The only other Dragons batter to look remotely competent was Kazuhiro Wada, who hit the hardest ball off Darvish, a sharp line drive that Fighters second baseman Kensuke Tanaka made a great jumping play on. Wada also hit an opposite field single to lead off the seventh inning, which after a sacrifice bunt by Takahiro Saeki turned into the only Dragons threat of the evening. But Darvish subverted that minor threat by dominating Ryosuke Hirata, who could only vaguely defend the strike zone, and Masahiko Morino, who struck out on three pitches. You couldn’t say that Chen matched Darvish pitch for pitch, but he put up a dominant performance in his own way. Chen scattered four hits in an eight-inning compete game, needing only 88 pitches to work through Nippon Ham’s lineup three and a half times. The difference in the game came in the top of the seventh, when Chen surrendered an uncharacteristic walk to Atsunori Inaba, then hung a slider to Sho Nakata on an 0-2 count. Nakata smacked a double off the left field wall, with the ball bouncing far enough from Wada to allow Inaba to score from first. Chen wasn’t rattled though, and with Nakata still on second, mowed down Tomohiro Nioka, Dai Kan Yoh, and Micah Hoffpauir. Though the results differed by the slimmest of margins, the two pitchers took differing approaches on the mound. Darvish’s arsenal is such that he can feature a couple of different looks. In this game, he featured at the power end of his range, relying on his four-seam, cutter and tailing two-seam/one-seam/shuuto. When Chunichi’s hitters started fouling the hard stuff off, Darvish would go to his slider or curve for a different look. Chen, by comparison, kept things a lot simpler. He fed Nippon Ham a strict diet of fastballs and sliders, showing great location and keeping nearly everything on the edges of the strike zone. To make an unfair comparison, he lacked Darvish’s velocity and movement, but he worked quickly, threw strikes, and knew what he wanted to do with each hitter. It definitely felt like he was pitching to contact, but it worked as he mostly limited the Fighters to infield pop ups and lazy fly balls. I don’t really have anything more to say about this game, so I’ll close with this remarkable fact. Darvish’s opening day: seven innings pitched, seven runs, seven earned. Darvish since then: 69 innings pitched, six runs, five earned. The 2009 Golden Glove Winners have been announced, and Nippon Ham dominated the Pacific League with seven players receiving the award. Tetsuya Matsumoto of the Giants became the first former ikusei player to win a Golden Glove.